Are you tired of paying the high cost of traditional cable TV? CTC now offers Skitter TV, a video service that gives you the capability of watching 30 TV channels including ABC, NBC, CBS and FOX over the Internet. 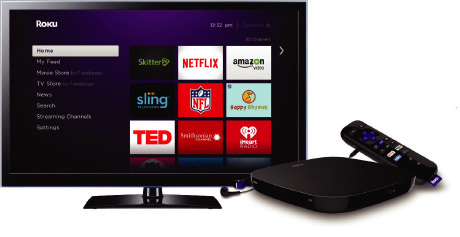 Plus, with a FREE Roku Premiere Player from CTC, you’ll have access to more than 2,000 channels including Netflix, Amazon and Hulu to watch your favorite shows and movies. No expensive cable subscription needed! Get 1 month FREE when you sign up for Skitter TV! *Certain restrictions apply. $31.95 bill credit for your first month, then regular rate of $31.95/mo applies. Taxes and fees not included. Must be a new or existing CTC Internet Customer. Not available in all areas. 2-year contract required. Price includes ebill and autopay. Phone service may be required in select areas. Call us today to sign up!